In the Winter of 2013, we made a grand journey to the south and followed the famous path now memorialized as the Natchez Trace Parkway. 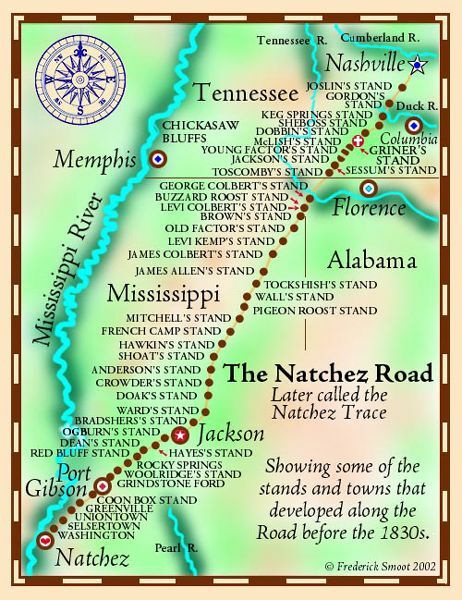 For thousands of years, people have been using the Natchez Trace, today memorialized as the 442-mile Natchez Trace Parkway that winds its way through the states of Mississippi, Alabama, and Tennessee, providing tourists exceptional scenery and thousands of years of American History. The earliest known people to utilize the forested road, called a trace, were the Mississippi Mound builders, whose culture flourished from about 800 A.D. to 1500 A.D. These hunters and gatherers followed the early footpaths created by the foraging of bison, deer and other large game that could break paths through the dense undergrowth. These early peoples also built roads, cultural centers and numerous earthen monuments, which were used as burial sites and temples, several of which can still be seen along the Natchez Trace Parkway. Later, the trace was frequented by the Choctaw, Chickasaw, and Natchez tribes who called the region home and traveled upon the trail on hunting and trading expeditions. By the time the first European explorer, Hernando de Soto, came to the region, the path was well worn and the Mississippi Mound builders were gone. Later, more explorers would use this “wilderness road,” followed by frontiersmen and pioneers. 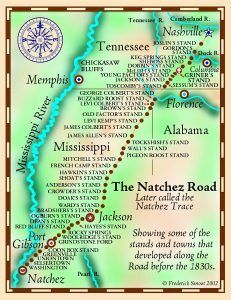 Some of the best known travelers of the Natchez Trace were farmers and boatmen from the Ohio River regions of Pennsylvania, Ohio, and Kentucky who floated supplies down to ports in Natchez, Mississippi and New Orleans, Louisiana at the beginning of the 1800’s. Regardless of where they came from, they were collectively known as “Kaintucks.” Other famous figures traveled the Natchez Trace, including Meriwether Lewis, who had previously led the Lewis and Clark Expedition. While making his way from Missouri to Washington D.C. in 1809, he died under mysterious circumstances at a small cabin in Tennessee. He was buried there, where his body remains today. Just a few years later, General Andrew Jackson traveled on the Trace with his troops during the War of 1812. From mid-1813 to mid-1814, Jackson and his troops left to fight the Creek War in what is now Alabama. Jackson took one of the Natchez Trace’s newest residents, John Gordon, with him. Captain Gordon became leader of one of Jackson’s companies of “spies,” or scouts. 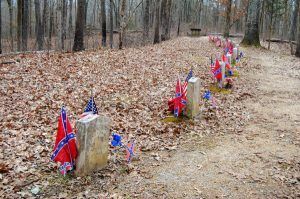 Gordon left his family and home at the intersection of the Natchez Trace and the Duck River behind, and became a Tennessee hero of the Creek War. With the conclusion of the Creek War, Jackson and his troops again focused on Great Britain and the Gulf Coast. In 1815, the misery of the 1813 trip up the Trace was likely forgotten with a more celebratory journey. The Natchez Trace was officially reestablished as a unit of the National Park Service in 1938. Years later, in 2005, the Natchez Trace Parkway was completed, extending from Natchez, Mississippi to Nashville, Tennessee. Today, the route still serves as a connection between population centers, and allows modern travelers to explore and discover the history and culture of earlier generations. The Parkway incorporates numerous visitor stops of historic, natural, and archeological interest, including seven Mississippi Mound sites. The Tupelo Visitor Center interprets the archeology and history of the Trace. Continue next page for milepost/points of interest along the Trace.